Whilst on the one hand it made me smile – there’s nothing quite like humour to take the edge of terrorist incidents – it did make me think as well, but that’s partly because of what I know about language and also some of my favourite TV shows when I was growing up. And I’m not sure I liked what I concluded. Daleks, as most people know. are the quintessential Dr Who villains; a totalitarian hive mind of slightly demented pepperpots intent on taking over the world. 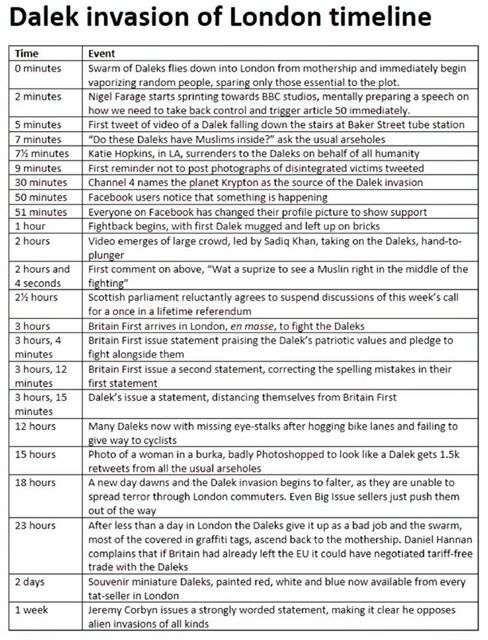 But has anyone (apart from me, who spends way too much time doing this) actually thought about what Dalek means? It’s a Serbo-Croat word that means “foreigner”. Now I had long gone under the impression that these were Romulans, but I am reliably informed (admittedly by Wikipedia) that these are Ferengi. 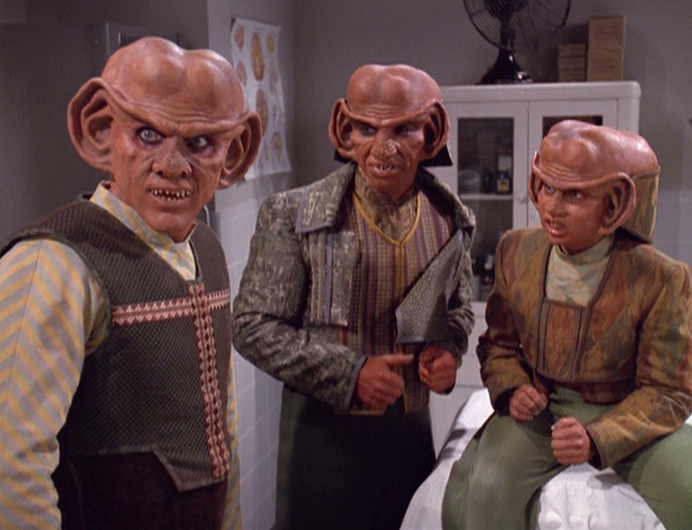 Ferengi is Sanskrit for (wait for it) – “foreigner”. And if you hang around Thailand long enough, you’ll soon hear the word “farang” which also means foreigner and comes from the Sanskrit. So now I’m wondering if my childhood viewing has tried to make me believe that all foreigners are bad guys and should be treated with suspicion. I doubt that this was ever the intent – and certainly Terry Nation was much cleverer than that – but it is bothering me. It’s that right wing idea that anyone who isn’t like us is to be feared and separated, which is almost a sure fire way of ensuring that they harbour prejudices in the future. And in light of recent terrorist events, that kind of separation, ghettoisation, “us and them” mentality really isn’t helpful. That said, if anyone does have any photos of Daleks falling down the stairs at Baker Street Station, they’d certainly cheer me up. Of late, I’ve found good biographies pretty difficult to find. Good biographies that are interesting and easy to read are rare enough; but a biography that is interesting and easy to read whilst simultaneously telling two life stories side by side is about as easy to find as unicorn poop. Finding this book, which details the lives of two women I’ve long found fascinating, can only really be described as a fine example of the best unicorn poop I’ve come across. If you see what I mean. It helps, of course, that Mary Wollestonecraft and Mary Shelley were mother and daughter and, in their own way, blazed particularly distinctive trails, one as an early feminist and political libertarian, the other as a noted Gothic novelist whose greatest creation survives today. One of the (many) things which struck me, however, is how despite having written a number of novels between them, each woman was best known for her first work – Wollestonecraft for A Vindication of the Rights of Women and Shelley for Frankenstein. The book interweaves their lives, giving each woman a chapter in turn – the first and final chapters are, if you like, joint chapters – shows the parallels their lives took to remarkable effect and allows the reader to show just how deeply the daughter was influenced by her mother, despite never having known her. The central figure linking both women is William Godwin, husband to one and father to the other. Gordon does not paint a terribly flattering picture of him and the most charitable view of him from the biography is of a curmudgeonly old hypocrite more interested in extracting money from his son in law than in having any kind of social relationships. Indeed, he frequently ignored his family members, noticing them only if a bill was to be paid or they had some money with which to settle the outstanding (and rising) debts. Of course, it is impossible to write about Mary Shelley without mentioning the Romantic poets, given her marriage to Percy Bysshe Shelley and the close association both of them had with Lord Byron. Both of the poets came across realistically, but I can’t help wondering if Gordon instinctively felt closer to the Romantics than she did to Godwin. Of course, there is always the possibility that Godwin really was a curmudgeonly old hypocrite and both poets were arrogant and idealistic, although Shelley seemed the more empty-headed and flighty of the two. Gordon makes extensive use of the women’s unpublished writings, relying on letters and journals to illustrate their mental processes and the development of their respective outlooks on life. For both women radical politics were of fundamental importance and their interpretations of what it meant to be a woman at the turn of the 19th century is still worth reading today. It doesn’t feel like much has changed sometimes, although at least wives are no longer their husband’s property – for now. This book was a chance find in my local library and I’ve loved every page of it. It’s an essential read if you love either of the main subjects, or even radical politics or Romantic poetry. It doesn’t feel like a heavyweight book, which is an amazing achievement for 500 plus pages. My first version of this blog was, I will admit, entirely different, mainly because I’d always thought this poem was written by someone else and wrote the entire blog about that person. This means, of course, that my wonderful theory about the underlying message in a piece of nonsense verse has become, of itself, nonsense. Poetic really. That said, the story behind this poem is still quite interesting. It was written by William Hughes Mearns, a child psychologist who believed that silly poems which attracted children’s attention would improve their language development and encourage creativity. It’s certainly easy to remember, and the silliness of seeing a man who wasn’t there is something that a lot of children do find appealing. And, because I thought it was written by Spike Milligan, led me to all sorts of interesting thoughts about mental illness that I’m going to share them anyway – even though they bear no relation to the poem whatsoever. At the time that Milligan was writing some of his best known nonsense verse – including my favourite, In the Land of the Ning Nang Nong – a common way of referring to people who suffered from mental health issues was to say that they “weren’t all there”. It’s not such a leap, especially for a child, from “not all there” to “not there”. As Milligan himself suffered from mental health problems, including depression, I’m quite sure he would have seen this aspect of the poem quite clearly. Looking at the poem in that light, it loses its silliness and becomes quite poignant. Can you imagine – being the man who wasn’t (all) there, not (all) there again today, and someone wishing you’d go away? What an indictment on how we treat the mentally ill! Although the next time I write a post about a favourite piece of nonsense verse, I’ll make sure I’ve established who wrote the poem well in advance of writing. A Host Of Golden – seriously? 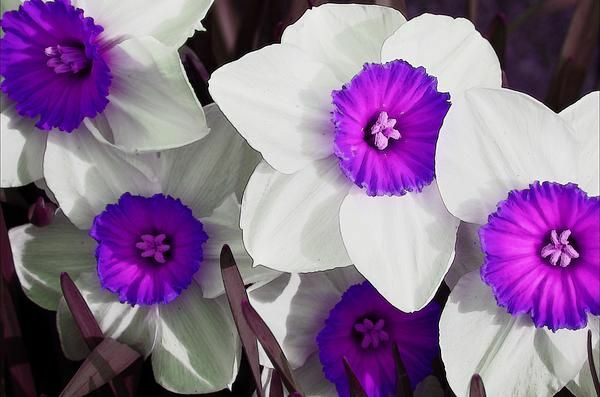 Every so often, I like to confuse people by demonstrating that flowers aren’t always the colours we seem to think they are. 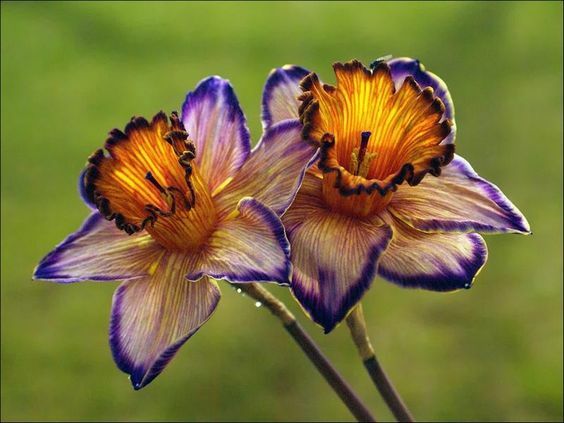 We may believe that irises are all blue, but they’re not – and when Mother Nature got her clever little mitts on the humble daffodil, she was hell bent on proving Wordsworth to be a pretty good poet but not much of a naturalist. 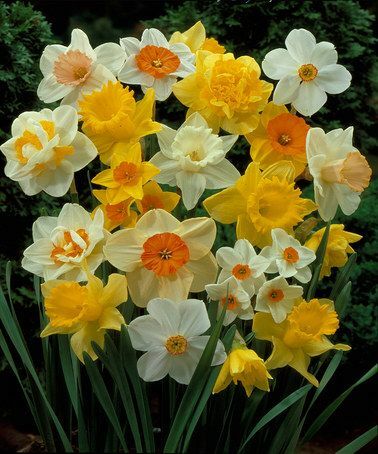 Most people are quite used to seeing daffodils in various shades of yellows – the lovely bright golden yellows, some with white petals and yellow trumpets, yellow petals with orange trumpets and even white petals with orange trumpets. 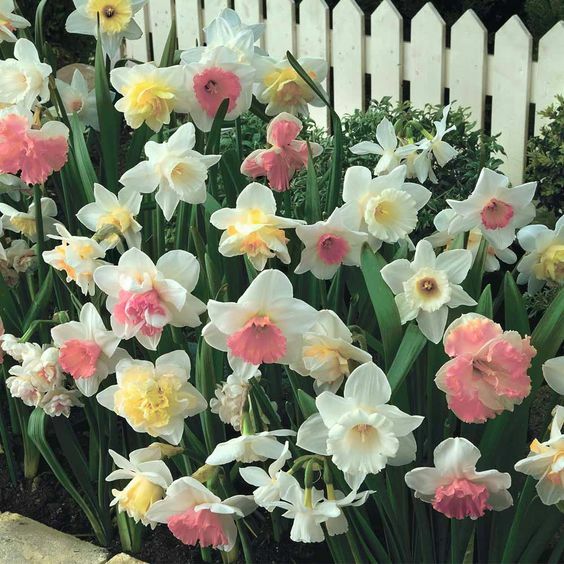 The lovely thing about these are that they bloom at slightly different times, so you can have a display of narcissi (to use their technical name) for quite a long time by being inventive with the varieties. They come in different sizes as well, so you can vary minis with standards and even giants. It’s really very pretty. So – don’t ever tell me that all daffodils are yellow. I may just be forced to get my paintbox out.